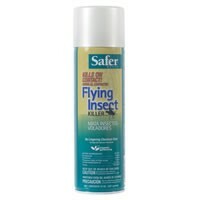 PRODUCT DESCRIPTION: Flying insect killer is the first effective, truly organic aerosol – closing the performance gap between synthetic and organic. It kills flying insects on contact. This organic pest control formula is CFC Free, so there is no chemical odor! Compliant for use in organic gardening, this formula is fast-acting, too! WHERE TO USE IT: To kill flies, mosquitoes, and moths: Prior to application, close doors and windows in the area being treated. Hold container upright and spray upward in a sweeping motion to all parts of the room. Treat areas around windows and other light sources since flying insects are attracted to these areas. Leave room after spraying. Keep doors and windows closed for 15 minutes after treatment. Ventilate room when treatment is complete. Repeat treatment as necessary.